Take a step into Danny Ladley’s office and one thing is evident: the man isn’t your typical film buff. 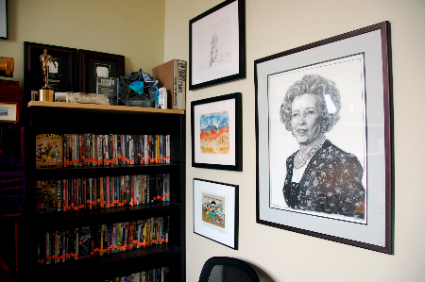 A signed Alexander Payne poster hangs on one wall. On another, an old photo of Ladley and Martin Sheen is displayed; next to it, awards, art and more autographed photos of actors. 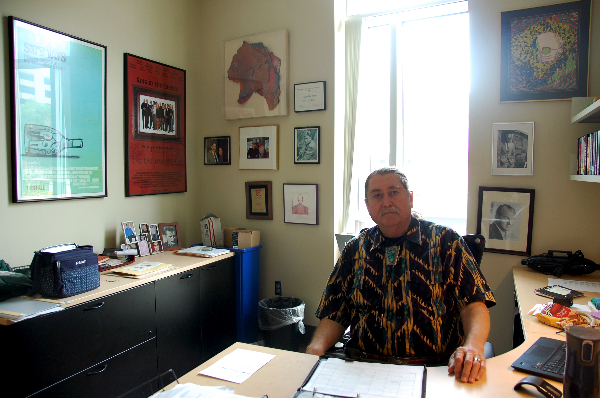 Across the room, shelves and cupboards hold movie collections and film memorabilia from the nearly 42 years since Ladley became director of the non-profit Mary Riepma Ross Media Arts Center. The theatre, which specializes in American independent and foreign films, started at the Sheldon Museum as a way to show film as an art form equal to other exhibits. In 1973, Ladley was brought in to move the program full-time. The first year he was there, Charlie Chaplin re-released his films after withholding them for many years. “It was a wonderful way to start,” Ladley said. Eventually, Ladley said, the film program outgrew the museum and needed a new facility. He turned to Mary Riepma Ross, an early patron of the film program with ties to Lincoln. 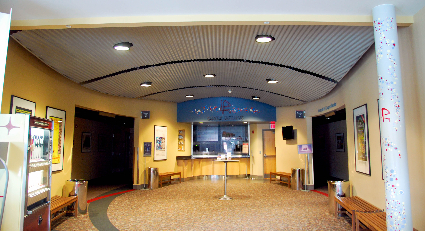 The result of her donation was the current Ross theatre, which is connected to the Van Brunt Welcome Center. After Ross’ death in 2013, the University discovered she had left the theatre a large endowment which will eventually grow to be nine and a half million dollars. "That will really help support the Ross even after I’m gone," Ladley said. "Which, it’s been 41 years, but I’m having too much fun." With the money, the theatre recently renovated its concession stand and plans to make additional improvements soon, including updating their speaker system. Thanks to Ross’ endowment, the theatre works to bring in almost all contemporary first-run releases and movies that wouldn’t show in Lincoln otherwise, Ladley said. He also said The Ross competes with many larger arthouse theatres with ticket sales oftentimes rising above the national average. In addition to showing films, the theatre also hosts special events and screenings, oftentimes bringing in filmmakers to discuss their work. This month, animator Bill Plympton will be featured at a special Q&A event where he’ll show his latest feature, “Cheatin’” an animated film about a wife who takes on the identities of her husband’s mistresses. The Ross also broadcasts performances from the London National Theatre and The MET Opera Live in HD via satellite. The first National Theatre upcoming show will be “Hamlet” starring Benedict Cumberbatch. In what's become a tradition for the theatre, The Alloy Orchestra will also perform with the newly restored 1920s film, "Man With A Movie Camera." The three-piece ensemble writes original music scores and performs them in front of silent movies. "And that’s always fun because they have regular instruments like piano, clarinet, percussion, but they also have this “rack of junk,” they call it, full of pots and pans and all kinds of stuff to make sound effects that go with whatever’s on the screen," Ladley said. Another unique upcoming event is a live performance in November by Pat Ward Kelly, the third and final wife of Gene Kelly. The show is a one-person multimedia play about the life of Gene that includes music and audio clips. That same weekend, a Cambodian filmmaker will come to show her documentary exploring village Cambodia life. When it comes to picking which upcoming films to show, Ladley looks at which ones receive good reviews or perform well at film festivals, and which ones he enjoys via screeners. Ladley said having the Ross in Lincoln is an asset as it allows important but lesser-known films to be accessible for the community.